Whiter, brighter promises in oral care A cosmetic oral hygiene line for the discerning consumer, Supersmile is a breakthrough in toothpaste development, using calcium peroxide (Calprox) to whiten without abrasion. 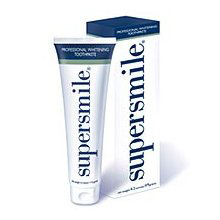 Supersmile also contains baking soda for fresher breath and healthier gums, as well as ADA-recommended fluoride. Invented by the president of the American Society for Dental Aesthetics, Supersmile gives people a dental-office look and feel that lasts between office visits. The line also includes a mouthrinse, floss and an ergonomically designed toothbrush.